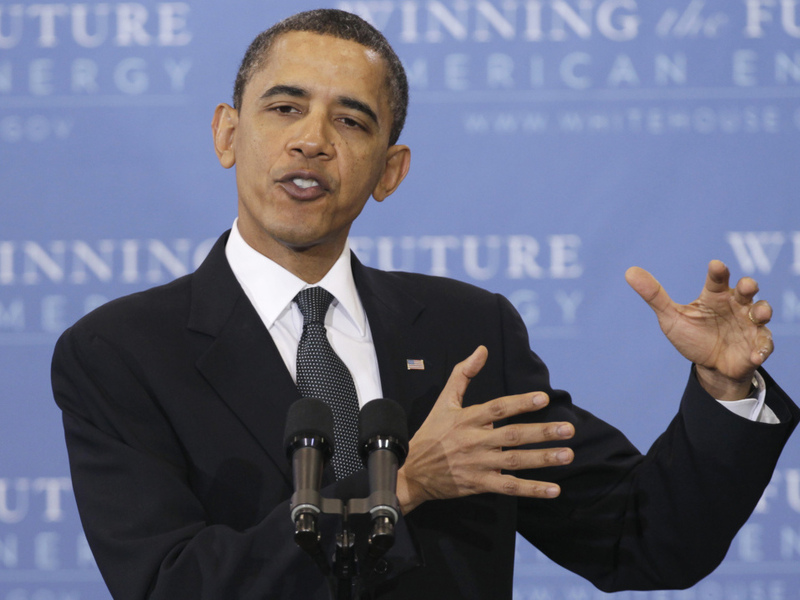 Obama Plays Offense And Defense On Energy : It's All Politics President Obama was on the offensive and defensive in his Georgetown University energy speech. He vowed to sharply reduce oil imports. President Obama talks energy security, Wednesday, March 30, 2011, at Georgetown University. With rising gas prices continuing to shock consumers every time they fill up their fuel tanks, President Obama is repeatedly reminding Americans that his policies are part of the solution not, as his political opponents claim, part of the problem. And so on Wednesday, just two weeks or so after he gave his last lengthy defense of his administration's energy policies, he delivered yet another one, this time at Georgetown University. That earlier speech was overshadowed by the Japanese earthquake and tsunami that happened just two days earlier. But while much of Wednesday's speech was about defending his approach on energy from Republican attacks, because White House aides had billed the speech as a major presidential address on energy, Obama had to do more than defend his policies. He had to go on the offense, too. So he issued what he said was a new and sweeping goal to reduce the nation's dependence on imported oil, which stood at 11 million barrels a day when he assumed the presidency, by a third "a little more than a decade from now." Note the lack of a specific year. Note, too, that he will be long out of office. So it's not the kind of goal likely to keep the president up at night since he won't have to answer for it. If reducing oil imports doesn't stir the imagination like, say, President John F. Kennedy vowing in 1961 that the U.S. would land a man on the Moon and return him safely to Earth by the end of the decade, it could turn out to be an even harder goal to achieve. The Space Race was embraced by Americans, both industry leaders and average Americans, out of patriotism during the Cold War with the Soviet Union and for the profits and jobs it produced. Reducing dependence on foreign oil, on the other hand, will mean companies and individuals increasing their costs, certainly in the short term, to convert over to cleaner or renewable energy sources. It will require changes in habits from many millions more of Americans than was true of the Space Race era whose demands fell most squarely on the aerospace industry. But, again, much of the speech was a restatement of the president's oft-stated goals to shift the nation to renewable and cleaner sources of energy. One of those, nuclear, has been on the minds of most of us lately and not in a good way, because of the crisis in Japan. The release of radiation by a Japanese nuclear power plant that was stricken by the tsunami following the massive earthquake, has led to more ambivalence if not outright resistance among Americans about nuclear power. America gets about one-fifth of our electricity from nuclear energy. carbon dioxide into the atmosphere. So those of us who are concerned about climate change, we've got to recognize that nuclear power, if it's safe, can make a significant contribution to the climate-change question. And I'm determined to ensure that it's safe. comprehensive safety review by the Nuclear Regulatory Commission to make sure that all of our existing nuclear energy facilities are safe. Japan in design and the building of the next generation of plants. that they're not spreading dangerous nuclear materials and technology. Also, as I said earlier, much of the speech continued the president's defense against Republican charges that his policies are preventing additional exploration and extraction of domestic energy supplies. He repeated his assertion that last year domestic oil production reached its highest level since 2003. As National Journal's Amy Harder pointed out, however, much of that increased production was due to oil and gas leases approved during the George W. Bush years. The president also repeated his charge that one of the favorite targets of Democratic politicians when gas prices rise — the oil companies — are "sitting on" leases they could be producing. Right now, the industry holds tens of millions of acres of leases where they're not producing a — a single drop. They're just sitting on supplies of American energy that are ready to be tapped. And that's why part of our plan is to provide new and better incentives that promote rapid, responsible development of these resources. And we're also exploring and assessing new frontiers for oil and gas development, from Alaska to the Mid- and South Atlantic states, because producing more oil in America can help lower oil prices, can help create jobs, and can enhance our energy security. But we've got to do it in the right way. At Obama's request, the Interior Department created a report which it released Tuesday, to buttress his contention about the unused leases. The report completely whitewashes the fact that in many cases, the reason these leases have no exploration plans is that (the federal agency that oversees oil and gas leases) is sitting on those plans. This is like leasing an apartment from the government for $20 million dollars – the government refusing to give you the keys to the apartment – and the government proceeding to complain because you are not occupying the premises. The disturbing reality is that 2011 could go down as the first year since 1957 that there has not been at least one offshore lease sale. Not one. As long as gas prices remain high, offering a ready attack line for his political adversaries, Obama will be under pressure to speak to show his empathy for increasingly squeezed Americans. So expect more of these speeches, though at some point it will get increasingly harder for him to pull a new ambitious-sounding goal as he did Wednesday with his vision of a nation using one-third less imported oil in a little over a decade.